Following on from his post ‘Me and my iPad‘, Phil Wade shares his experiences of working in a university classroom laden with tech. 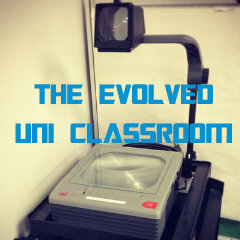 Tech in my ELT classrooms has always seemed to be CD players, the odd fixed or allegedly ‘portable’ OHP or an old to ancient lab. Since the introduction of cheap smartphone and tablet packages, things have been changing recently though. It hit me last week that all my uni classes now are filled with teched-up students; I.T. students all have fancy laptops or smartphones, as do Business students and even some from other departments. Tablets have started appearing too. Actually, if I did a BYOD day, I’m pretty sure the room would be packed full of devices. Moderating and utilizing a class full of tech brings many challenges but also opportunities for me as a teacher. The first issue is WiFi connectivity and whether it will work. This can make or break any lesson. A slow connection can mean lengthy page downloads while sporadic WiFi connectivity can lose inputted data, crash an app or stop your web-based lesson flat. For instance, any video you wanted to show or interactive exercise relies on reliable and fast WiFi access. Flash, it goes without saying, is another obstacle. This counts out tablets and phones. I have an Android 4.2. phone and it doesn’t play Flash, neither does my iPad. Of course, you could use the Puffin browser which seems to run some basic Flash sites or jailbreak your device which, apparently, lets you bypass the OS and so run anything. I would never attempt this though. Video and podcasts are great but logistically a problem. Headphones are needed or a sound system and a projector. Power supplies or batteries? In some techie unis every student has a desk with a socket but it keeps students stuck to that place. Monitoring activities can be tricky, even in the classic horseshoe shape as you need to clamber over leads and jostle past screens. Powerpoint may have been sufficient 10 or 15 years ago when it still retained an impressive element but not now. A student with an iPad, iPod, i… expects PPT or something similar. It is a given. Facebook, Twitter, Instagram, Skype etc. I read that 60% of an average employee’s time is spent surfing and on Social Media sites. I would say that it could be the same in some universities where laptops are used daily and phones are in every pocket. Thus, managing this situation is difficult. It could be a case of boredom, supposedly ‘bad students’, addiction or maybe students are just so connected, that is the norm now. Students will always be miles ahead of us where tech and trends are concerned so there is no point trying to keep up with them. Whatever cool app you think you have found that will amaze students, they’ll know loads better and will probably be more than happy to show them to you. Student-centred learning is Techland for me. Sharing a video activity or game and letting groups go for it at their own speed is exactly what I’ve always wanted. I used to end every Blended Learning grammar lecture/seminar with a game for pairs or groups. As I soon realised every pair progressed at very different speeds, I started offering a range of activities from beginner to advanced. After 2 hours of heavy grammar presentations and closed grammar practise on laptops, this was a way to relax. Making it competitive also made it fun too so I often asked for final scores at the end to select a winner. Writing is quickly done on devices and, if using a Google Doc, is ready for correction in minutes. Cameras and microphones are available to everyone with a phone or tablet it would seem but not many use them in class. If you remember the ‘live listening’ trend, it could easily be recorded and viewed back in pairs. Simple activities like ‘prepare a 1 min talk about….’ can be transformed with a pron element just by recording attempts, listening back and improving on them. My current focus is on pron. Cameras are a godsend as students often don’t know they aren’t doing the correct mouth movements. A tech-supported classroom immediately enables tech homework-ready students and people eager to use cloud computing to share docs, do online research, etc. Making a class Flipboard is a great way to collate sites and Social Media posts around one topic. The free apps let anyone view the Flipboard on any device. I think you can also add collaborators and comments too. In some classes, I update their Flipboards on Fridays to reflect the week’s topics. I try to select some revision activities, a few sites that work on their weaknesses and some harder stuff to extend their level. Duolingo is invaluable for lower students or those who really want and need to study English. I introduce it to all my students in lesson 1 and make sure they register and complete a unit. Every student thinks it’s great, particularly as it works on phones. If I had time, I would follow their progress, which I do with private clients. I myself used Duolingo to learn French and asked my teacher to revise what I learned every week. My ideal situation is using tablets/phones for online work as part of an activity and not just for the sake of it but having the projector as the centre of the lesson. For me, showing and controlling a video is much easier done via a projector. Giving TinyURL links is easily done and it’s great for sharing Google Docs for brainstorming or writing as everyone can see the writing in progress. For instance, I wanted to discuss the syllabus of a new course with a group recently so I set up a shared doc with 10 suggested topics, created a TinyURL and included it on my PPT. I then asked students to read the doc, discuss the suggestions with a friend and add some of their own with their names. I watched all the updates via my mobile. I am a poor man so I don’t have an iPhone but Google Docs still works so I walk around noting errors and ideas on my phone which then syncs to the doc on the screen. I think an iPhone can do this direct with Apple TV or wirelessly with an Epson projector. I share any PPT via a folder on Dropbox and minimise any handouts. I would love to have an ‘app of the week’ that would lead on from the lesson or revise what we’ve done. Another idea, with very motivated students, is to get them searching for, sharing and discussing related articles or videos, maybe even on Pinterest. I tend to ask students to be honest about what they want and how much they are willing to do. For instance, if students will do 2 hours of homework a week, I will add this into my lesson objectives. Thus, a reading, listening, oral practice, writing or revision activity would be given for homework. The difference here would be that it is included in the lesson plan as essential and not just extra homework. Games always go down well but students don’t always see the educational benefit. As a warmer, livening up a dull grammar point or a fun post-lesson activity, they are great but more pedagogical ones would be even better. I did use the L’Oreal Challenge game a few years back which was more of a simulation and an online stock market trading game every week. Tech should be making my life easier but elevating lessons too. We’re not at that stage yet but we could be. Apps and games are the big attractions for smartphone and tablet users. I read an article recently that said most smartphone users prefer downloaded game apps to anything else and it seems to show that people use apps far more than browsers to access web content. Our students are also smartphone users so doesn’t it seem appropriate to make more ELT game apps? The problem is investment I guess but how about a platform for teachers to make their own? Imagine an online course full of activities you could pick and choose from that could be done on tablets and phones but still retained a heavy speaking focus and then the ability to quickly create an app every week based on workbook resources. Each would be tailored to every course. With the right platform it could be possible. ELTjam would love to hear from more teachers or trainers about their experiences with EdTech. Whether it’s a website, device or application, how has it helped you and your learners? Phil is a freelance teacher of BE and ESP in France who is always looking for new ways to improve his teaching with tech. Featured Photo Credit: cgfaulkner via Compfight cc. Text added by ELTjam. I would love to have a site to go to for this kind of content too. I don’t think creating apps however will be as easy as you hope. But the idea of integrating apps with classroom content is a good one as this seems to be the most natural delivery system for young people. Do you think Knewton will want to be in an ecosystem that pays the iOS 30% tax? Won’t these companies try to move us to computers where there is no tax and they can charge for their content? Do you see any resistance to the iOS system among Edutech providers? What I am waiting for is the ability to do Jigsaw activities in class with mobile devices. Do you know of any such programs? Very true about the tax point. I used to hate Apple as I was very against the amount of control they have but I have got used to it. My I.T. students often rage on about Android and Linux being open and I see laptops/notebooks now running these at a lower cost. Yesterday, I read about a USB for 8 dollars that runs your own Android and saves all your work on it. If people are spending less on the tech then the apps/software should be the same. I always liked the idea of the Raspberry Pi and teaching kids to code. The tech divide seems to be huge at the moment and is used to charge high fees for programming. One guy I know was charged 5K for a cheap website. What I would like to see is some freelance app developers working with ELT specialists and reacting to market demands and pushing the envelope. If the guy from Angry Birds can make a huge and very profitable app in 2 days, imagine what a group of app people and teacher/writers could do in a week? So, to get back to your questions, every class I use tech with is always divided into Android vs. iOS with a couple of Linux and Windows 8 people hiding away. Uni students would probably never buy anything, even at private places so any app expenditure would be on the organisation which tend not to have any budgets so on the teachers. I have lots of free apps and I never even look at paid ones. If I have some private students in the future willing to use Blended Learning and will pay for the fees as part of my invoices then, yes, I will spend but upto now, I haven’t seen anything that is worth splashing out on. I think apps date very quickly too. Lots on Google Play look like they were made in 1980 while some iOS ones from 2012 already look old. I downloaded an app for making games which seems perfect for learning vocab of places, objects, people, etc. All you do is take pictures and then make a jigsaw or play matching. Sorry for getting you confused with Tim who I first thought wrote this piece. thanks for the reply. I guess so but I hope they start teaching this type of class on the Celta.